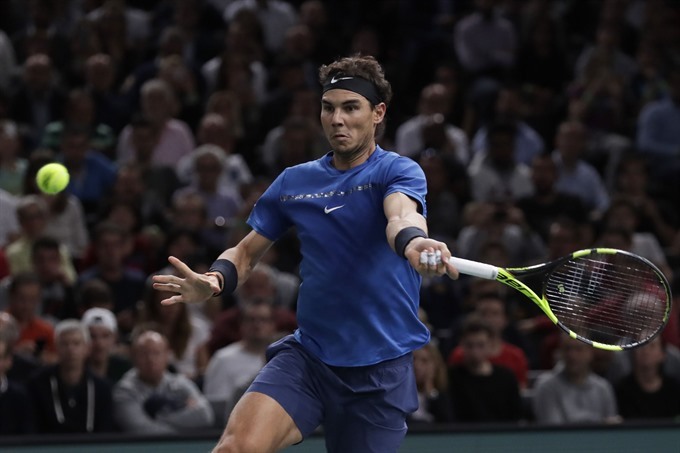 PARIS — Rafael Nadal insisted he would be ready to play at the World Tour Finals in London later this month, despite having his knee strapped during his Paris Masters last-16 win over Pablo Cuevas on Thursday. The world number one called the trainer to tape his right knee after losing the second set in his 6-3, 6-7 (5/7), 6-3 victory. Nadal was plagued by knee problems in 2015 and 2016, before roaring back into form this season by winning the French and US Open titles. "Well, of course, (I’m) 100 percent okay," the Spaniard told a press conference. "Of course, I going to be playing in London normally, if nothing happens. It depends (on the next) one week and a half. Anything can happen in one week and a half. "But if nothing strange happens then I’m going to be there, of course." The 16-time Grand Slam champion is bidding for a record 31st Masters title at Bercy, having secured the year-end number one ranking on Wednesday. Nadal will play 77th-ranked Serb Filip Krajinovic in the last eight on Friday, ahead of a possible semi-final meeting with Juan Martin del Potro. "It’s not the moment to talk much about the knee," the 31-year-old added. "It’s more the moment about talking about the quarter-finals. I won an important match for me.